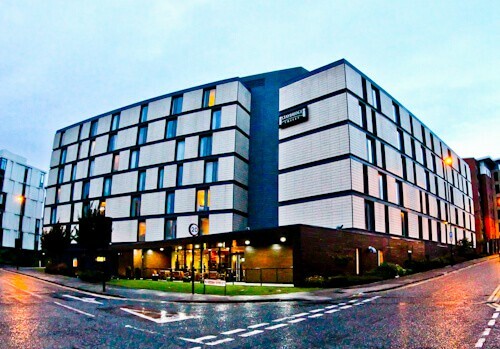 You should consider the Staybridge Suites, Newcastle if you want a location within walking distance of all Newcastle attractions including the football stadium. 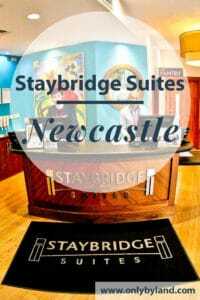 Check out the Staybridge Suites, Newcastle website for the best room rates or Twitter and Instagram for the latest events. 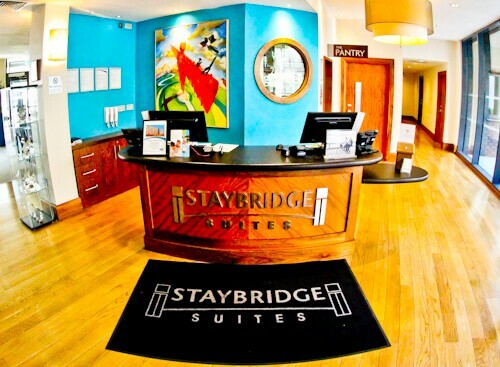 Staybridge Suites Newcastle is located a 5 minute walk from Quayside and the Millennium Bridge. It’s conveniently located for the center of Newcastle which is a 10 minute walk away. If you arrive by train or bus (as I did) you can easily walk to the property. If you are driving, the property has secure parking around the back which is perfect as you can leave your car and walk to the points of interest of the city. St James’ Park, the home of Newcastle United football club is located in the city center so the hotel is perfect for those visiting Newcastle on match day. At check in you’ll be welcomed by friendly staff. I’d recommend telling them why you’re in town so they can best fulfill your needs. I was in town to visit the points of interest so they provided me with a map of these and recommend my route. You’ll notice a painting behind reception which features many points of interest of Newcastle. There is the Angel of the North, the Tyne river and its bridges. On the angel wings is a local bird known as a magpie. The nickname of local football team Newcastle United is the magpies. A studio suite is perfect for those staying in Newcastle short term and for solo travelers. The studio suite, like all rooms at Staybridge Suites has its own fully equipped kitchen. The fact there is a kitchen makes it friendly for vegetarians, vegans, those who eat halal, are traveling with kids or don’t want to eat out. There is a guest of the day everyday at the Staybridge. This means if you are lucky you could become guest of the day. On this day you will receive gifts in your room such as wine and chocolates. 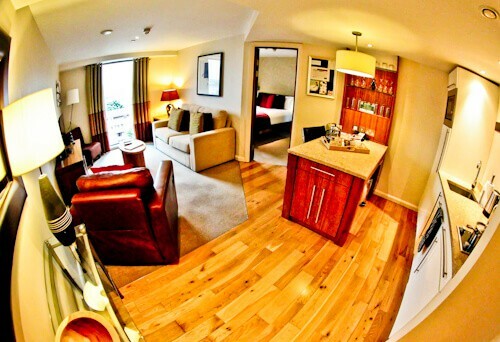 The one bedroom suite is perfect for those traveling to Newcastle long term on business. You have your space to do your work, your cooking area and when you want to relax you can close the door and enjoy your bedroom. For long term guests, the longer you stay the less you pay. According to tax laws in the UK, tax is reduced for those staying a long period of time. I’d recommend you email the hotel directly with any long term plans to take advantage of this. A one bedroom suite is also perfect for those traveling with kids to Newcastle. Maybe you’re on a family trip to watch a football game. You can park your car at the hotel and walk to the stadium from here. In your room you have a sofa bed which is perfect for the kids. You can use the fully equipped kitchen to cook the food your kids like. 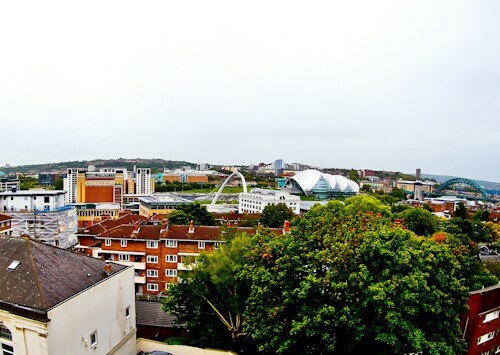 Make sure you request a room with a view of the famous bridges of Newcastle when you make your booking. From my window I could see the Millennium Bridge, Tyne Bridge, Baltic Center and Sage Gateshead which are some of the major points of interest in the city. The view at night is more impressive than day because the Millennium Bridge lights up and continuously changes color. I find photographing bridges difficult but around the hotel there are photos of the famous bridges. You can get some good inspiration from these pictures on how to photograph them for yourself. The fitness center is open 24 hours a day. 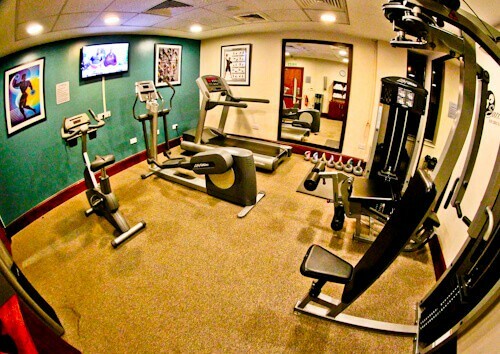 You’ll find kettle bells in this fitness center which is rare for a hotel. With kettle bells you work your muscles as well as doing cardio at the same time. Kettle bell swings, snatches and cleans are definitely the exercise of choice in this fitness center. Whilst traveling, one of the most difficult things to do is keep on top of your washing. At Staybridge Suites Newcastle you get complimentary use of the laundry room. With four machines it’s unlikely you’ll have to wait to wash your clothes. 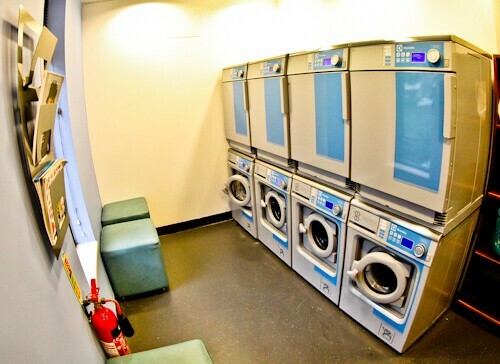 The laundry room is incredibly useful for those staying in the hotel long term. Located next door to the fitness center you can incorporate your washing with fitness. Whilst you’re waiting for your clothes to wash and dry you can work out. Alternatively you can enjoy a free coffee and read a magazine. 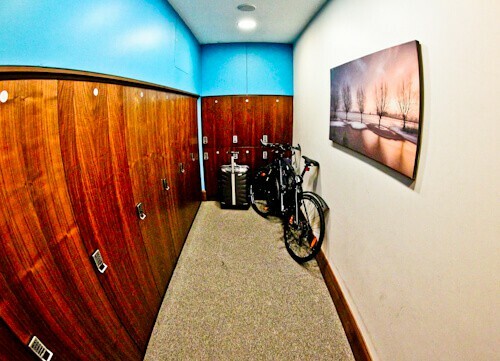 Lockers are perfect for long term guests. If you visit during the week and go home weekends then you can leave your things safely in a locker. One guest at Newcastle has bought a bike so he can get some exercise. When he goes home his bike is waiting safely for him in the locker room. Only staff have access to the locker room so rest assured your things are safe. 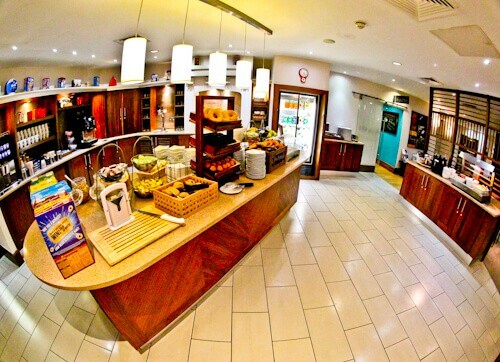 There is a complimentary breakfast buffet every morning at the Staybridge. What is unique about the breakfast is that you can see the brands of the foods you are eating. I was happy to see my favorite brand of cereal and orange juice. It does make a difference when you are familiar with the food you are eating, it’s good for kids too. Also available are fresh fruits, fresh breads, sweet breads, bacon, sausages and eggs. The coffee machine is on 24 hours a day and you are free to help yourself. Disposable cups are available so you can enjoy your coffee to go. On Monday to Wednesday evening there is a social hour. 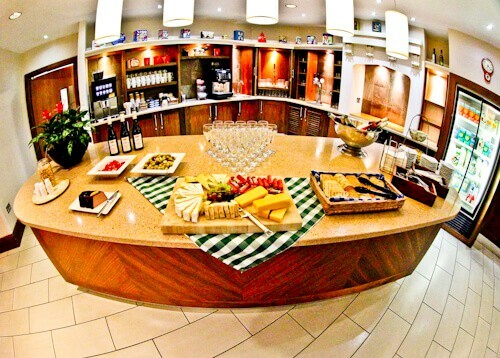 During this hour all guests are welcome to enjoy complimentary wine, beer, soft drinks, cheeses and snacks. This is a good time to meet other guests in the hotel as well as staff. If you have any questions about what to do in the city or need information about the hotel, social hour is the perfect time to do this. Be sure to email the hotel directly if you are staying long term or plan to bring pets. Even if you’re only visiting short term you should email and request a room with a view of the Millennium Bridge. Check out the Staybridge Suites, Newcastle website for the best room rates or Twitter and Instagram for the latest events. 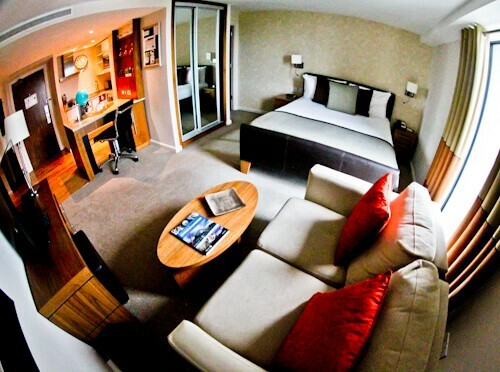 Check out the Staybridge Suites in Liverpool. When looking for a place to stay, location is crucial for me. 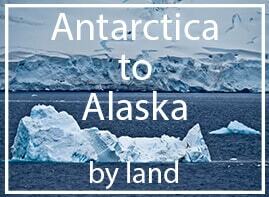 The fact that this one is about 10 minutes’ walk from the nearest attractions is a good thing. The list of amenities is also quite hefty. But the best thing for me is the architectural facade, that is so unique and beautifully designed! Staybridge suites looks wonderful stay option as it offers big sizes room with many other facilities like laundry, gym and lockers. Buffet Breakfast is also a good option with these suites as sometimes we dont like to cook though we have kitchen option. Rooms are spacious and good for family. View from room is also good. What? This place had me at COMPLIMENTARY LAUNDRY! That is such an amazing feature, and the fact that it’s 24/7! The idea of having a social hour is pretty cool too! Pet friendly is definitely a plus for me! I have never been to New Castle but hear it’s amazing!! The 24 hour fitness center is just up my alley! Especially with jet lag I never know when I wanna work out! Wow, this looks like a great hotel with so many perks. I love when you can walk to places rather than having to worry about driving and finding parking. And, of course, I’m all about that breakfast buffet! Looks like you had a great stay! 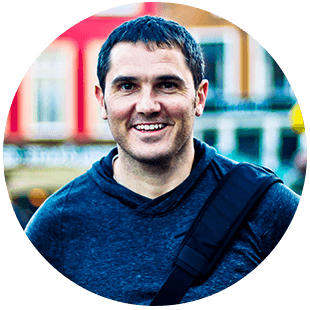 Location is so important in picking a place–we’ve gotten to the point where it’s *almost* our #1 priority if we can afford to make it one (after wifi, of course). The social hour looks like a cool idea–you don’t see those in larger hotels much. The decor is beautifully carved. Staybridge Suites is one Paradise I must try. And right from my room, I can view the famous bridges of Newcastle. Staybridge Suites is a home in a foreign land. I’m sure I’d be so comfortable. This definitely seems like a hotel with a lot going for it. The location is the most important thing we consider and well above the mattress and room size which comes in at a distant 2nd & 3rd. We’ve never been to newcastle but whenever we do go, you’ve probably made choosing a hotel easier for us! Newcastle is one of those places I always have trouble trying to decide where to stay! Location is definitely important to me and this looks like a really lovely place inside too. Sometimes you never know! This place seems to have tons of extras too! Complimentary laundry?! Wow, I’m in! Having a kitchen in every room is a nice bonus too. Looks like a great place to stay! I’ve stayed in a Staybridge before, but not this one. I actually haven’t been to Newcastle, but there seems to be pretty cheap flights from where I live in Dublin so I might make a visit. This hotel looks like a great option. I love the fact that they have a social hour. As a solo traveler the lack of social functions and meeting people has made me prefer hostels over hotels, but this social hour puts this hotel on my radar.